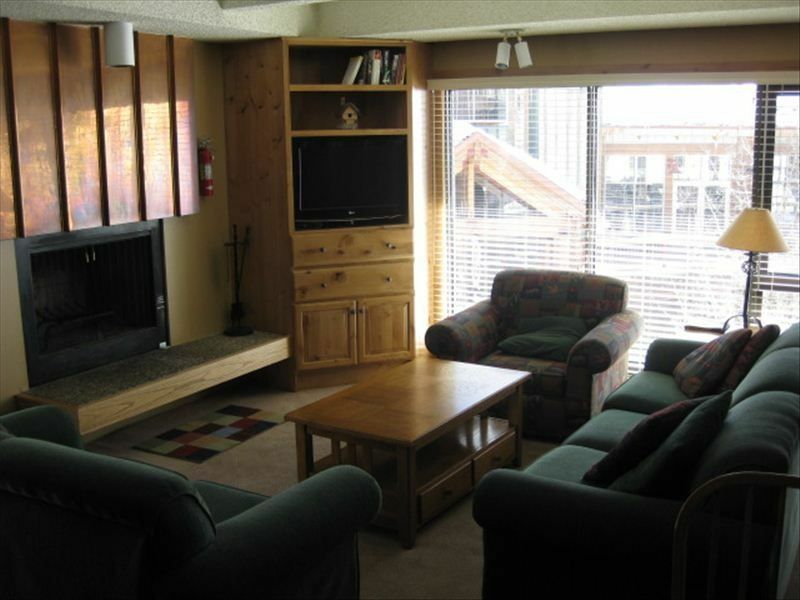 •	Spacious Living Room with great view of the slopes! •	50 feet from "Super Bee" lift and Tubing Hill (East Village) - TRUE ski in/out! •	Second bedroom with two twin beds. •	Wood burning fire place. •	Pets allowed! (Pet fee applies). •	Quiet third floor end unit (elevator in building). I am a native of Chicago, and have been skiing for as long as I can remember. My parents purchased a condo at Copper in 1980, and I enjoyed coming to Copper often while growing up. I wanted to carry on that tradition with my three children, so I purchased my place in Snowflake in 1998 where my family could gather to relax, ski, enjoy the outdoors, and be together. Condo faces the ski slopes. (2) Located on first floor of building. Overall a very nice spot to stay at a good price. Would have been good to know that it resides on the side of the hill that is for more advanced skiers/boarders. With that said there was easy access to the shuttle and restaurants / other amenities. I would have given it 4 star, but the heat wasn’t working in the secondary bedroom. Still a nice place to stay and a good location. Great condo in fantastic location! We had a great experience staying in Nancy’s condo just steps away from the Super Bee loft. We had a great view of the slopes and had beautiful sunny weather (once we actually got there) so it was even more enjoyable. The condo is very cozy, comfortable, and well equipped. It was the perfect size for 2 adults and 2 teenagers. The only warning I would give is if you’re particular about your pillows (which we apparently are) I would bring your own b/c these were pretty hard, but that is really our own issue! It was lovely working with Nancy. She provided lots of good information and was quick to respond. We landed in Denver the day of a horrible blizzard and were unable to make it up the mountain for our first scheduled night. She graciously refunded our money for that night, not everyone would be so kind and understanding and it was greatly appreciated. All in all, I would highly recommend this rental. Not only is the building in a good location, but the condo’s location (and included parking spot) are about as good as it gets. We look forward to returning in the future!! Thank you so much for your kind words. Your arrival date was probably one of the worst travel days in years! I've been in touch with the property management company regarding the pillows. We agreed that new ones are in order, so we are in the process of getting those replaced. Thank you for bringing that to my attention. Hope to have you as a guest again soon! Perfect for a weekend getaway. Nancy is the best host that we have ever encountered. We really appreciated being able to take breaks during our ski day and pop back to the condo with the kids. It was easy to stay in and cook or take the family and head out for the evening. Thank you! You'e touched on one of our favorite reasons we love the condo! Glad you had a great time! You can practically ski right up to the building. This unit was very nice with great views. The twin beds and lots of games are a plus for kids. Thank you. Our family of four really enjoyed our stay at this condo. It had everything we needed and we loved relaxing apres at JJ’s then sitting g by the wood burning fireplace in the evening at the condo. Beds were comfortable and the condo was well kept and super convenient. You can ski right to the base of the complex. My husband and I, our college aged son and our small dog stayed in this condo 1/5-1/12/19. We have another son working the Copper lifts this year. This condo is truly in the best location we have ever stayed. I’m not a skier and it provided the dog and I with a great place to hang out while the others skied with great views of the slopes. We cooked in several nights and conveniently shuttled to Frisco and Center Village other times. JJ’s across the street was a great option for music and food as well. Thanks for a great week. It is great to find a good condo option when we occasionally travel with our dog.